Pepin County offers many lakes and rivers for avid canoers and kayakers. Learn more about the rivers and lakes in the Big Woods. The trail runs from Durand to Eau Claire, WI. Access the trail in Durand near Tarrant Park. A state trail pass is required for people who bike or in-line skate. Walkers, runners, and skiers are free to use the trail without passes. No passes are required on the trails within Eau Claire, Lake Hallie, or in Pepin County / Durand. Visit the DNR website for information. See map of Pepin County portion of the trail. The most beautiful spot on the Mississippi River. Lake Pepin is a natural lake, popular for boating, fishing, sailing, bird watching, swimming, waterskiing and spiritual renewal. Lake Pepin is a naturally occurring lake and the widest naturally occurring part of the Mississippi River located approximately 60 miles downstream from St. Paul, MN. It is a widening of the river on the border between Minnesota and Wisconsin. The formation of the lake was caused by the backup of water behind the sedimentary deposits of the Chippewa River’s delta. It has a surface area of about 40 square miles and an average depth of 21 feet which makes it the largest lake on the entire Mississippi River. A warm sunny marina with beautiful sunsets over Lake Pepin. Location: 303 1st St, Pepin. Hours of operation: Open May 1 – October 15th. Sunday – Thursday 8 am – 6 pm; Friday & Saturday 8 am – 8 pm. WIMNSail is all about adventure, relaxation, and learning aboard Rudder Chaos, my 30 foot sailboat on Lake Pepin. She resides in Pepin, WI, during the season which runs mid-April to the end of October. Join Cliff for some of the best smallmouth bass fishing you’ll ever see. Cliff Haugland has been catching big walleyes and bass on the Mississippi River and across the upper Midwest for a long time. Cliff and his sons also fished the MWC Tournaments and qualified for the national championship in 2006-2007. Cliff would like to share his extensive fishing knowledge with others to help them enjoy the great outdoors. Check out our website for rates or more information. 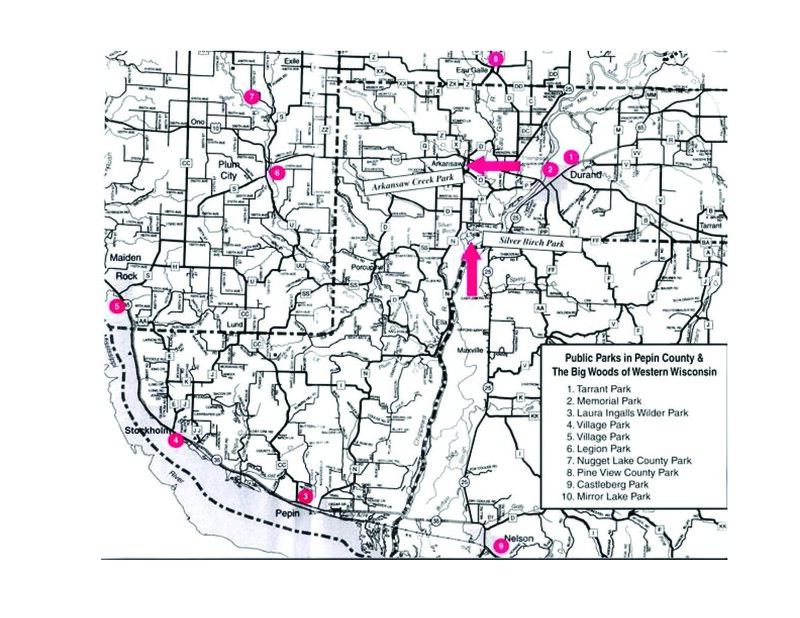 There are many parks in the Pepin County area. Some offer camping and others are great places for day trips. View our county park map to see the location of the parks. Explore the 13,000 acres that the Tiffany Wildlife Area has to offer. Canoeing, hiking, hunting, fishing, bird watching, wildlife observation, and camping are just some of the many things you can do. Please check the Nature/Wildlife Areas link on our website. Take a ride in an antique open-air train through the Tiffany Bottoms Wildlife Area, part of the Lower Chippewa River Delta Wetland Gem. The confluence of the Chippewa and Mississippi Rivers forms one of the most extensive and biologically diverse deltas in the Midwest. Participants will see expansive lowland hardwood and floodplain forests, sloughs of the Chippewa River and open wet prairies with blooming flowers and grasses. The area also offers excellent birding opportunities. Check the Chippewa Valley Motor Car Association website for schedule and contact information. Once the Stockholm Opera Hall, now the home to the WideSpot Performing Arts Center and Community Project, the 100+ year old space is once again becoming the center piece of the community and a vibrant, creative home for the performing arts of all kinds. Expect the unexpected. One weekend you may find theater and classical music, the next might bring independent film and a gospel “hotdish” brunch, followed by dance, comedy, poetry…. a deep palate of the arts. All of this being expertly choreographed and curated by a staff deeply dedicated to the arts and the power of the arts in building community. The not-for-profit Center will be available for community use during non-performance times and a portion of proceeds will be dedicated to local organizations and charities. Visit our website for upcoming Events & information. Rolling Greens Golf Course is a mature 9-hole golf course on gently rolling terrain that meanders its way through the coulees. There are an abundance of trees throughout the layout clearly defining each hole. There are selectively few sand traps and water hazards making your round as enjoyable as possible. The course has a wonderful design with no two holes alike. Many of the greens have dramatic slopes and undulations made popular in the 20’s and 30’s which make putting a sure challenge and requires placement of approach shots well below the hole. Location: 1324 3rd Ave West, Durand – near the hospital. From Eau Claire go southwest 28 miles on Hwy 85. In Durand to south .5 miles on Hwy 25 or Prospect St; turn left on Hwy PP or 3rd Ave West. Open daily at 6:30 am until 10 pm. Durand boasts one of the finest cheese plants in the state of Wisconsin. Eau Galle Cheese produces over 9 million pounds of Parmesan, Asiago and Romano cheese each year. We invite you to stop by Eau Galle Cheese Factory and taste some of Wisconsin’s best cheeses and view “The Art of Cheese Making” video. We take pride in offering the largest cheese selection in the area with flavored cheeses and cheese curds. Our large retail store has wonderful gifts, collectibles and even a year around Christmas shop. We also feature locally made honey, maple syrup, sausage, wines and ice creams (seasonal). Easy online ordering available at www.eaugallecheese.com. Open 7 days a week; Monday – Saturday 9 am – 5:30 pm and Sunday 11 am – 4:30 pm. Located on Hwy 25 just 20 minutes south of Menomonie. Located on 13 scenic acres for numerous outdoor activities or venues with a spectacular view of the Chippewa River. Newly remodeled facility with 2,100 square foot dining area & 1,500 square foot bar area. 15 acre outdoor venue for hosting events located on the bluffs of the Mississippi River. Check website or Facebook for their live music played on the stage built into a rustic bar. Groomed paths lead through the woods to sitting areas & flower gardens. Tent camping, bathroom & campfire facilities are available. Rustic wedding venue tucked away in the valley of Pepin. We are open every Tuesday regardless of the weather once we are open for the season. Enjoy a homemade pizza baked in our hot brick oven on the farm or take pizza out. You will need to bring your own plates, napkins and beverages (other than alcohol) if you choose to picnic on the farm. We now sell wine & beer by the bottle – bring your own glasses. Homemade sourdough bread baked in our hot brick oven is also available..